A recent appeal to our Taylor cousins for tales about the old trunks that have been passed down through generations produced a few pictures and stories. Undoubtedly, there are more out there. Other stories can easily be added. ﻿﻿If you have a family heirloom such as a trunk, or know someone who has one, you understand the sense of history that is felt when you look at it. Just thinking about our ancestors who opened the trunk to add their keepsakes gives us a sense of connection. Old trunks were not decorator pieces in days gone by! Indeed, they were important storage places, or used as luggage to carry things from one place to another. The first Taylor trunk is one that belonged to Pachie Taylor Stevens, daughter of William Carroll & Sarah Sephronia Taylor. It was passed down to Pachie's younger son, Verbon Stevens. The family story is told that Pachie and her husband, John, along with their two sons traveled in a covered wagon from Winston County to Lawrence County, Tennessee about 1920 where they made their home. This trunk, no doubt, made that trip. When Verbon brought the trunk home from his parent's home place, the condition of the trunk was very rough. Years of use left it in a very tattered condition. 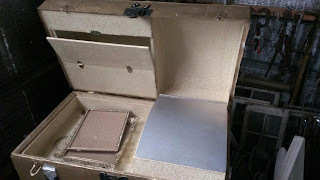 Verbon took the trunk to a local antique dealer in his hometown to inquire about restoration. The shop owner sent it away for "renewal." The expert restored the exterior of the trunk, while the interior was relined by Verbon and his wife. Today the trunk is in the possession of Pachie's granddaughter. As her grandmother did so many years ago, she also keeps special items in it. Her granddaughter continued her own mother's tradition of saving the newspaper on the day her two children were born. Among other special things, those newspapers along with the one saved by her mother on the day of her own birth are tucked away inside the trunk for safe-keeping. 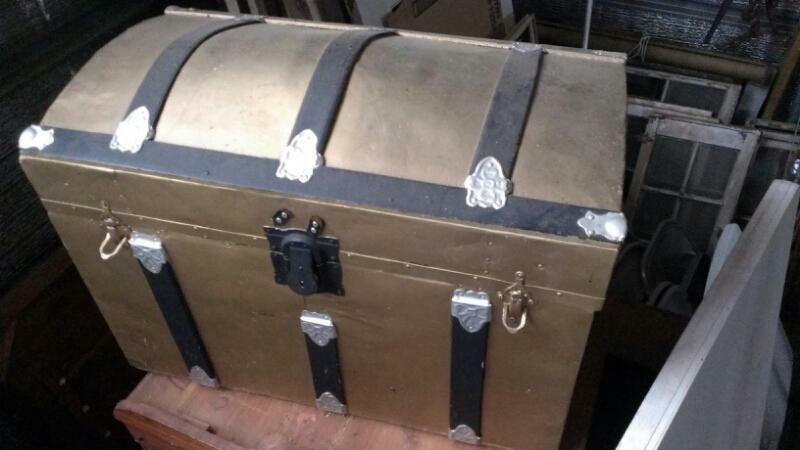 The second trunk, belonging to Newman Oliver Taylor son of Alonzo & Margaret Taylor, was passed down to Newman's son. 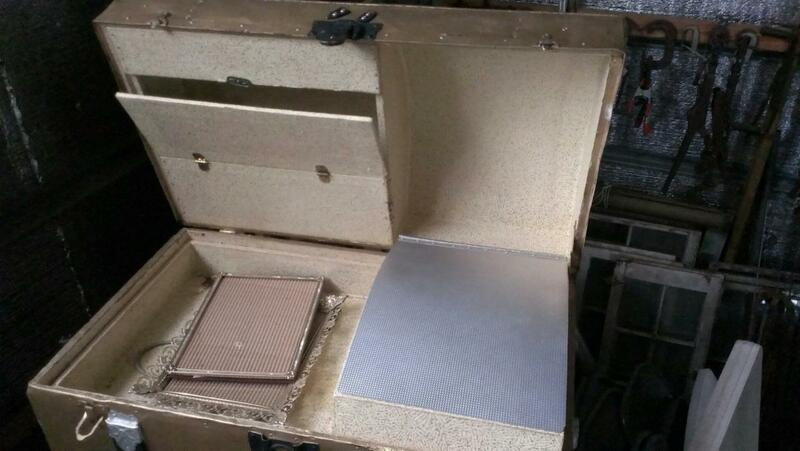 This dome trunk contains several interior compartments and a tray system, including a drop down compartment. These were designed for hats, shirts and perhaps documents. A trunk kept by Margaret Stephens Taylor, wife of Alonzo, held a host of newspaper clippings Margaret collected about Winston County World War II soldiers. Neatly cut out of the newspaper, Margaret saved the articles about the men from Winston who were serving their country. Many articles included the soldier's picture in military uniform. In October 2012, these treasured clippings were given to the Winston County Archives in Double Springs, Alabama so that others could enjoy the history. Margaret never knew how her commitment to the soldiers would be seen by others...over 60 years later. Another treasured item kept in Margaret's trunk was the original record book of Liberty Grove Baptist Church in Winston County. Margaret's husband, Alonzo, was the son of William Carroll Taylor--a founding member of the church. As church clerk, Carroll kept and used the book. He passed it down to his son, Alonzo. The book held the handwritten church records beginning in 1881 through about 1919. The files have been preserved by the Samford University Manuscripts Department in Birmingham, Alabama. The original book has been returned to Liberty Grove. Trunks are special family treasures...they represent a connection to the rich history of our family!